In time, the trickle of referrals will most likely become a fast flowing river. Making efficient, timely and accurate diagnostic decisions becomes very important. With this in mind, I've added a new webpage to help you sort through the many similarities and differences between language and literacy disorders. In this issue you will find a link to a webpage and a pdf download that features information that will help guide you when making a differential diagnosis between children with language disorder, reading disorder and reading comprehension difficulty. I hope you find the information useful. Once you click on the link, please scroll down the page and click on the link to download the language literacy disorder guide. 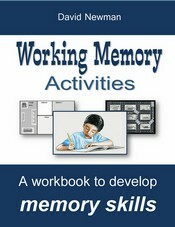 Also, I'm pleased to announce the imminent release of a new resource: Working Memory Activities. This 178 page workbook will be released as a downloadable ebook and as a hard copy book. The workbook will be offered with a discount to subscribers of this newsletter.